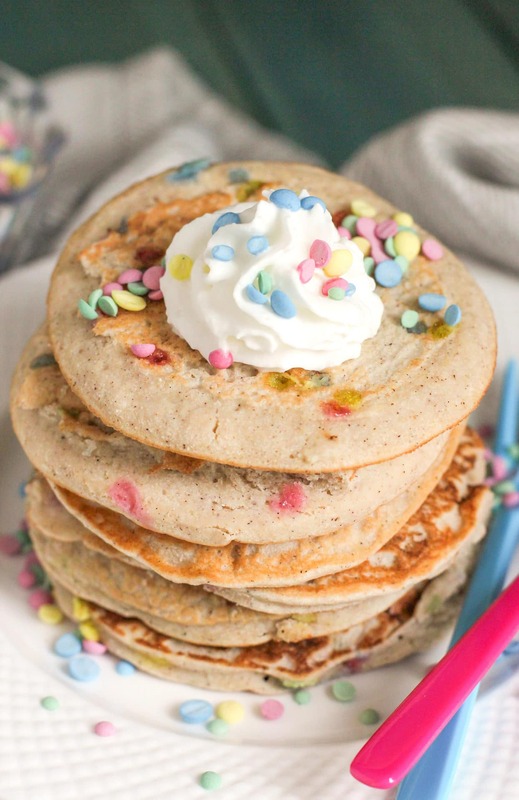 These sweet and buttery, fluffy and delicious, HEALTHY Funfetti Pancakes are secretly all natural, refined sugar free, low fat, high protein, high fiber, gluten free and dairy free! Yes, this is real life. No, you’re not dreaming. I had to make FIVE batches of these pancakes in order to finally make it to this successful (and mighty glorious) recipe, but all that time and recipe testing was SO so worth it. The first batch was really tender but it had no structure. With a drizzle of pure maple syrup, the pancakes nearly disintegrated into moist crumbs with every forkful. I eventually had to eat the mush with a spoon. I mean, it was absolutely delicious, but way too delicate to be considered pancakes, and far too inconvenient when you’re ravenous in the morning. The second batch was just as tasty as the first batch but it was super gooey in the middle, despite being cooked for what seemed like forever. The third batch was a little too moist in the center yet again, causing me to overcook them (aka burn them). Oops! The fourth batch was tasty, tender, and structurally sound, yet a little too thin for my taste. I like fluffy and puffy pancakes. Thicker is better in my opinion. These Healthy Funfetti Pancakes are fluffy and puffy, sweet and buttery, and 100% addicting… now THAT’S how I like my pancakes! 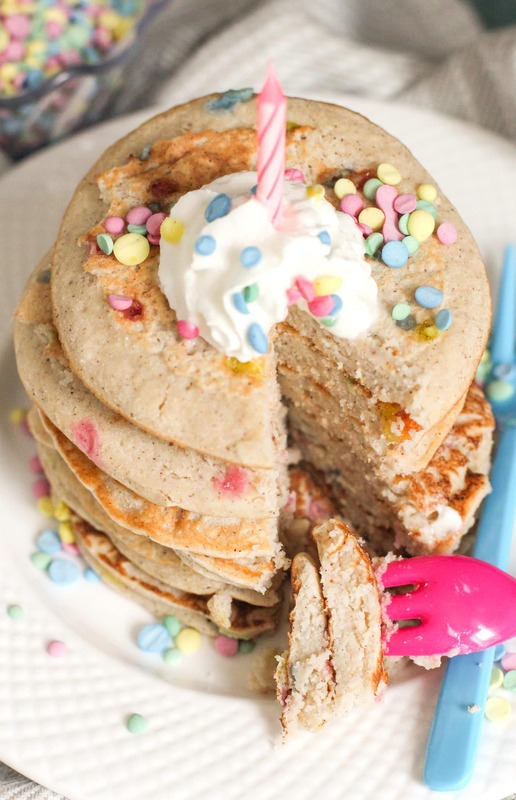 These sweet and buttery, fluffy and delicious, HEALTHY Funfetti Pancakes are secretly all natural, refined sugar free, low fat, high protein, high fiber, gluten free and dairy free! Spray a nonstick griddle with cooking spray and place over medium heat. In a small bowl, whisk together the sorghum flour, coconut flour, baking powder, sweetener, and salt. In a large bowl, whisk together the almond milk, egg white, vanilla extract, butter flavor, and almond extract. Dump the dry ingredients over the wet ingredients and whisk vigorously. Gently stir in the rainbow confetti JUST until mixed throughout (don't overmix, otherwise the confetti will probably melt into the batter). Scoop ~¼ cup of the batter onto the griddle. Cook until bubbles appear on the surface of the pancake and the edges appear dry. Flip and cook the other side. Continue this until all the batter is used up. Serve immediately with fresh berries, natural whipped cream (be careful, some brands contain hydrogenated oils! I use Soyatoo Rice Whip) and more Homemade Rainbow Confetti! 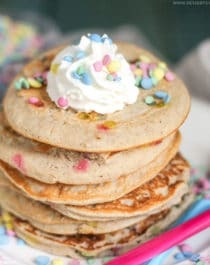 Unlike the typical (unhealthy) Funfetti Pancake recipes out there, this recipe contains zero trans fats, no synthetic food dyes, no artificial flavorings, no white sugar, and no bleached white flour. Healthy fats, complex carbs, lots of fiber and tons of protein. This is the kind of breakfast we can feel good about indulging in. So I noticed that you’re food is “low sugar, low fat,” and you expressed your frustration about finding “healthy” recipes that “aren’t healthy cause they’re either low in sugar and high in fat or high in sugar or low in fat.” And this website is full of recipies that are low sugar AND low fat. Just to give your “fat zone” a buffer, fat, ESPECIALY saturated, is not bad, but good, good, good. REALLY good. If skeptical about my info, please lookup the detoxinista.com, wellnessmama.com, and Mark’s Daily Apple. You can look on their websites for how fat is GOOD. I love eating a ton of fat and I’m not fat at all….RESEARCH IT! Trust me, I have no issue with fat! 🙂 Healthy fats are extremely beneficial/REQUIRED for the human body. I don’t believe that anyone should omit fat from their diets or go on a restrictive low fat diet (unless you have been diagnosed with specific medical issues or have had your gallbladder removed or something). Eating fat-free or low-fat is not what this blog is all about — it’s about finding balance and eating in moderation. Personally, I like to make recipes on the low-fat side because I like to top my desserts and baked goods with higher-fat toppings (like peanut butter on a single-serving muffin, frosting on a low-fat cupcake, etc). Just like how it’s not good to eat too little fat, it’s not good to eat too much fat. When you top high-calorie/high-fat foods with high-calorie/high-fat foods, it adds up. I try to make my recipes suitable for everyone — those who are trying to lose, maintain or gain weight. It’s easy to make a high calorie dessert by adding some extra toppings (I have a pretty high metabolism, so this is what I do most of the time), but it’s hard to make a high-calorie dessert low in calories. I struck a balance between the two by just making low calorie desserts, and if you want/need extra calories/fat, add some chocolate chips, add some peanut butter, add some pure maple syrup, etc. I have tried many a protein pancake recipes, and the majority of them haven’t cooked well at all or they were just awful tasting. But THESE, these are the ULTIMATE pancakes. The right consistency, flavor.. everything. I will definitely make these again. Thank you for coming up with amazing recipes! That’s too bad that some other pancake recipes didn’t work out. That’s exactly what happened to me when I was testing out THIS recipe… they were like mush in the center, no matter how long I cooked them… odd. Anything with both healthy and funfetti in the title have my vote, 100%. These are such a fun way to start the day!